Here is my twitter thread on our upcoming Discussion Forum on reproducibility in cognitive neuroscience at the journal Cortex. I've posted it to my blog because, weirdly, it appears on twitter to be broken on some browsers (but not others!) To see it on twitter, start here. This week I received a nice email informing me that I have been elected as a Fellow of the Association for Psychological Science. A warm thanks to whoever nominated me -- I have no idea who you are, but I appreciate your faith in me. In the spirit of using this position to achieve something meaningful, I have put myself forward for consideration as Editor-in-Chief of the journal Psychological Science. The turnover of the Journal's editorship offers the opportunity to elevate Psychological Science from being the flagship journal of the APS to becoming a global beacon for the most important, open and reliable research in psychology -- an example not just for other journals in psychology but for science as a whole. I am a professor of psychology and cognitive neuroscience at the School of Psychology, Cardiff University (see here for homepage including basic CV). I currently serve as a senior section editor at six peer reviewed academic journals, including BMJ Open Science, Collabra: Psychology, Cortex, European Journal of Neuroscience, NeuroImage, and Royal Society Open Science and I previously served on the editorial board at PLOS ONE and AIMS Neuroscience. Among other initiatives, I co-founded Registered Reports, the Transparency and Openness Promotion (TOP) guidelines, the Peer Reviewers’ Openness Initiative, and the accountable replications policy at the Royal Society. In total I have edited ~200 submissions, including ~120 Registered Reports. As a senior editor of Registered Reports, I am experienced at managing teams of editors. I am a fellow of the British Psychological Society (BPS) and was recently awarded fellowship of the Association for Psychological Science (member #119281). In 2007 I was awarded the BPS Spearman Medal and in 2018 my book on the need for reform in psychology won the BPS Book Award (Best Academic Monograph category.) As chief editor of Psychological Science, I would complete the important mission that Steve Lindsay began, implementing a range of policy reforms to maximise the quality and impact of research published in the Journal. Steve Lindsay, and Eric Eich before him, have done a superb job introducing the APS and Psychological Science to the world of open science. I am standing for consideration as chief editor on a manifesto that will consolidate and extend the mission that they began. Psychological Science currently offers a limited version of Registered Reports in which the format is available only for direct replications of selected previous studies published in the Journal. I will expand the format to offer full Registered Reports and I will appoint a dedicated Registered Reports editor. I will commence discussions with funding agencies to support Registered Reports grant models in which a Stage 1 Registered Report to Psychological Science is simultaneously assessed by the Journal and the funder, with successful proposals achieving provisional acceptance and funding support on the same day. I will introduce an Accountable Replications Policy in which Psychological Science guarantees to publish any rigorous, methodologically sound replication of any previous study published in the Journal. This initiative will be similar to the policy I recently launched at Royal Society Open Science and the European Journal of Neuroscience. Hypothesis-testing is just one way of doing science. I will introduce a new Exploratory Reports format, similar to the initiative I helped shape at Cortex, to provide a dedicated home for transparent exploratory research employing inductive or abductive methods. This format will focus on generating ideas and testable predictions for future studies. I will review the Journal’s current policy concerning OSF Badges, seeking to raise standards for the awarding of the Open Data, Open Materials and Preregistered badges. I will appoint a dedicated Reproducibility Editor to oversee this review and the badges programme. Psychological Science is a signatory of the Transparency and Openness Promotion (TOP) guidelines. I will implement the TOP guidelines at the Journal, achieving a minimum of Level 2 across all eight standards. Among other requirements, this will mean that all empirical articles must either make anonymised study data, analytic code, and digital study materials freely available in a publicly accessible repository, or the authors must explain in the article the legal and/or ethical barriers to archiving. The appointed Reproducibility Editor will oversee the implementation and compliance with TOP. I will implement a simple policy of open review in which all reviews and editorial decision letters are published alongside the corresponding articles, with the action editor identified and reviewers retaining the choice to either sign their reviews or remain anonymous. I will launch a new ultra-short report format in which independent authors are given the opportunity to repeat and expand the analyses of original data in published articles in the Journal. The format will serve to verify or challenge the original authors’ conclusions and subject the results to robustness checks. I am standing for this role because I believe that psychology faces one of two possible futures. In one, we fail to reform our research culture and diminish. The legacy of psychology will eventually be forgotten, along with its enormous potential in understanding the mind and helping society. In an alternate future, we seize this moment -- right now -- and lead the way in placing quality and reproducibility at the heart of our scientific mission. 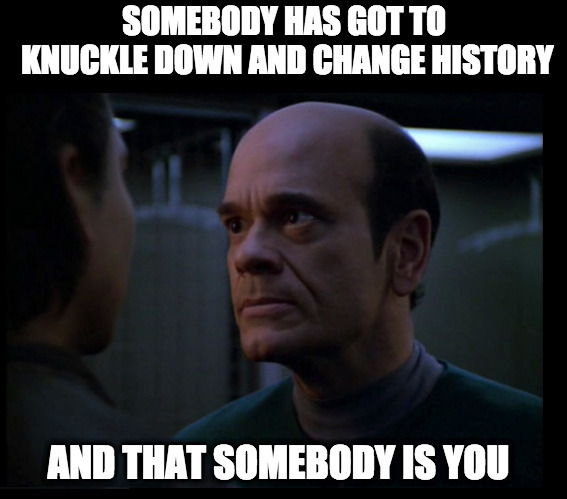 I’m reminded of that signature episode of Star Trek Voyager when the Doctor says to Harry Kim, desperately trying to alter the timeline and save his crew: “Somebody has got to knuckle down and change history, and that somebody is you”. If that somebody is you then let’s do this together. Email editorsearch@psychologicalscience.org and support my nomination as the future editor of Psychological Science.